Less than four months after the long-delayed Baha Mar partially opened its first phase and fewer than four months before the region’s peak season, a battle royale is brewing between megaresorts for the tourist business in the Bahamas. About eight miles east of Baha Mar, the 3,400-room Atlantis Paradise Island is fighting to maintain its share of the island’s visitors between this year and next amid the addition of Baha Mar’s 2,300 rooms. Baha Mar, which at an estimated $4.2 billion in construction costs will be the most expensive development in the country’s 44-year history, opened in late April, including some 300 rooms at its Grand Hyatt, a 100,000-square-foot casino (the country’s largest), an 18-hole Jack Nicklaus-designed golf course, a 30,000-square-foot Espa-branded spa and a handful of food and beverage outlets. The resort also features a high-end retail arcade that included brands such as Rolex, Bulgari and Tiffany. 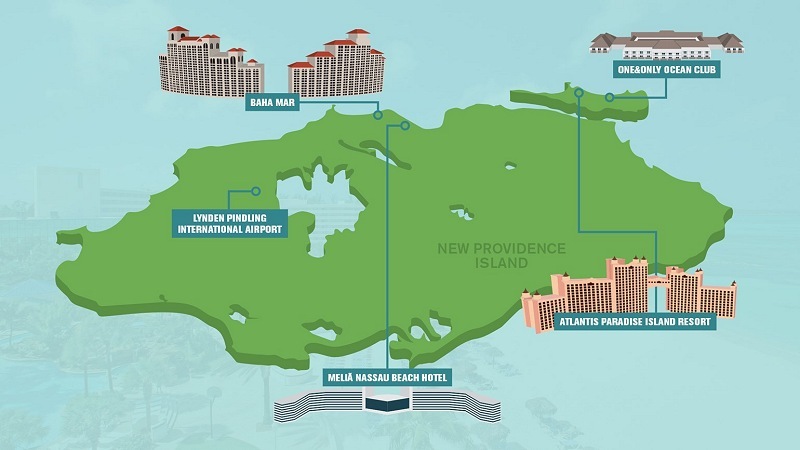 This year, Atlantis owner Brookfield Asset Management will sink as much as $90 million into the 206-acre property and is adding family-friendly amenities such as a soda fountain in the lobby and a swim-up Popsicle bar. Next month, Karawan said, Atlantis will begin improvements to its Marina Village collection of shops and restaurants adjacent to Atlantis Marina. Not to be outdone, both Melia Nassau Beach and One & Only Ocean Club, which are located adjacent to Baha Mar and Atlantis, respectively, are touting their own recent improvements. The 694-room Melia Nassau Beach, reflagged from the former Sheraton Nassau Beach in 2013, has received $19 million in improvements since reopening in 2014. The all-inclusive resort was slated to be part of Baha Mar under its original developer, Sarkis Izmirlian, and may eventually be marketed as part of the megaresort, though no timetable has been set. Meanwhile, the 105-room One & Only Ocean Club, which, along with Atlantis was acquired by Brookfield Asset Management from Atlantis developer Kerzner International in 2012, completed a multimillion-dollar renovation in late 2015, upgrading its Hartford Wing and adding a 125-foot oceanfront pool in the process. Resort owners and Bahamas officials alike are hoping that such improvements and new inventory will help the island shed its reputation as a party destination and cruise ship stop to place it alongside higher-end Caribbean destinations such as the British Virgin Islands and Turks and Caicos. Caribbean resort demand had steadily surged since the recession, with regional revenue per available room (RevPAR) rising 28% between 2011 and 2015, according to STR. Last year, though, Caribbean RevPAR fell almost 3% and was little changed through June, said STR, which does not disclose Bahamas-specific figures. With the addition of Baha Mar’s rooms and casino, other Caribbean destinations could feel a boost, according to Scott Smith, managing director at consultant CBRE Hotels. While destinations like Grand Cayman and Turks and Caicos might not be affected, Baha Mar could lure some business away from resorts in Puerto Rico, the Dominican Republic, Jamaica and even the Miami area. Baha Mar continues to position itself squarely in the luxury category, hinting at a more refined experience than Atlantis’ largely family-friendly offerings. Baha Mar’s officials also said the resort’s occupancy as of last month was “above our expectations,” though they declined to offer specifics. Atlantis, which Karawan estimates attracts about 800,000 annual overnight visitors, is playing up its Bahamas pedigree. This February, the resort added a weekly feature called the Junkanoo Experience in the lobby of its 1,201-room Royal Towers in a nod to the massive, costumed street parade of that name that traditionally takes place in the Bahamas on Boxing Day, Dec. 26. Atlantis’ Marina Village will also add a restaurant specializing in fish fry, a Bahamas specialty. So far, Baha Mar’s reviews have been mostly positive. Like Atlantis, it last month held an average TripAdvisor rating of four (out of five) dots across its 109 reviews (compared with more than 6,100 reviews of Atlantis). The new resort got raves for its finishes, its cave-like, aquarium-adjacent pool area, its beach and its casino. Pans included references to Baha Mar’s service, limited food and beverage options, high food prices and its sign-age, or lack thereof, not to mention the continuing construction. As for pricing, One & Only’s rates are easily the highest. For late-August weekends, One & Only last month was offering rooms ranging from $779 to almost $3,200 a night for a two-bedroom, beachfront suite. Atlantis’ nightly rates ranged from $152 for its lowest-priced Beach Tower rooms up to $404 at its all-suite Cove building. Melia Nassau Beach, which is all-inclusive (its Black Angus steakhouse is the only one of its 11 food and beverage offerings that’s a la carte) ranged from $284 to $1,532 a night for the Presidential Suite. And Baha Mar’s Grand Hyatt pricing ranged from $192 to $347 a night (the SLS wasn’t yet bookable as of last month). As for the upcoming peak season, Baha Mar, whose Grand Hyatt will eventually have 1,800 rooms, will add a 300-room hotel under SBE’s SLS lifestyle-hotel brand as well as three more food and beverage outlets, including SLS mainstays Katsuya and Cleo, by this fall, and it plans to launch its first marketing campaign in December. By next spring, the resort will include a 300-room Rosewood luxury hotel (CTFE owns Rosewood) and as many as 40 food and beverage outlets. Baha Mar has also announced plans to develop the 15-acre Long Cay private island just offshore for Baha Mar day visits, family activities, organic farming and marine-biology programming. In addition to the work at Marina Village, Atlantis next month will begin making improvements to its entry-level Beach Tower, while Atlantis’ Blu Pool will be renovated and reopened by November. Next year, the resort is also planning upgrades for its Royal Towers, which are geared more toward the couples/social crowd that Baha Mar’s SLS is also likely to target. While Baha Mar and Atlantis will likely to continue to try to differentiate themselves in advance of the peak season, CBRE Hotels’ Smith said that the growth in demand for both resorts will largely be tied to improved airlift to New Providence’s Lynden Pindling Airport. Although the airport offers direct routes to cities such as Atlanta, Chicago, Dallas, Houston, New York and Washington, there is no direct service from Boston, Los Angeles or San Francisco. With that in mind, Davis said Baha Mar is in talks with carriers to increase airlift to feeder markets such as New York, Atlanta, Orlando and Fort Lauderdale, while Karawan listed Chicago, Houston and Dallas as markets where Bahamas officials are looking to expand on existing routes. To read more at Travel Weekly, click here.